Happy and Blessed Easter from the Saskatchewan Branch UELAC. No April foolin' Loyalist Ties Under Living Skies, Conference 2018 is approaching quickly! Registrations are arriving steadily; we are excited that attendees are coming from coast to coast. Here are details about the program. The pre-conference meetings designed to give Branch Genealogists and Membership Chairs a chance to network and brainstorm will be held during the day. The official opening ceremonies on Thursday evening will bring us excitement and education as we visit CFB 15 Wing. In the morning the first free educational seminar will feature a presentation by RCMP Veteran Ken Fader on "NWMP March West 1874" and highlight Loyalist connections. During the second seminar our Dominion Genealogists, Angela and Peter Johnson will give some great insights into getting your Loyalist application up to speed with hints on research avenues. After lunch the buses will load for your choice of tours. Tour One: Don't let the word "Farm" fool you; there is much to amaze you as we change your perspective of "flat" Saskatchewan landscape as we explore a working family farm. Upon our return to the city there will be a photo op with "Mac" and tour guides will join us to review the downtown murals. Tour Two gives you a chance to explore one of four Western Development Museums. In the late 19th century, the lure of free homesteads brought tens of thousands of people to the province. This museum reflects one of the largest machinery collections in Canada. Did you know that Saskatchewan has more roads per capita than anywhere in the world? With it's population scattered over vast regions, getting around was not easy. The transportation collection with everything from canoes to snowplanes shows how Saskatchewan people met the challenge. A Prairie Feast will tickle your taste buds for the Friday evening banquet. UELAC business will be covered in the AGM, in the afternoon you will have the opportunity to explore the wonders of Moose Jaw or rejuvenate in the soothing mineral spa waters. You will not be disappointed with the Gala Banquet. In the morning we will worship with St. Andrews' United Church before we say our good-byes for another year. Register today! The Committee looks forward to welcoming you with genuine Prairie Hospitality. The registration form and more details are on the conference pages where new information is posted as it becomes available. Welcome aboard! Today marks the launch of Celebrate Twenty, the 2018 Scholarship Challenge. We invite every UELAC branch, every member, every friend of Loyalist history to support academic research by giving to the Loyalist scholarship program. Twenty years ago, with the establishment of the Loyalist Scholarship, UELAC identified scholarship funding as a priority. Your participation in this year's campaign affirms that decision. A wise man once said, "A good head and good heart are always a formidable combination. But when you add to that a literate tongue or pen, then you have something very special." We are asking for a commitment of $200 per branch for the Scholarship Endowment Fund. With every branch taking part we have the potential to raise over $5000.00. A twenty-dollar ($20) individual donation puts your name on our list of generous donors. Or perhaps you'd like to add a zero and make it $200, or $2000! We are more than happy to receive your gift of any combination of twenty. On a leap of faith, we are setting our 2018 celebration goal at $10,000.00. Each donation will receive recognition through Celebrate Twenty updates in Loyalist Trails. A 2018 campaign update announcement will take place at the UELAC Conference in Moose Jaw, SK. For donation details and to track donation progress go to the 2018 Scholarship Challenge page. Please check in often for updates on scholarship activity. Thank you for your ongoing financial support of the Loyalist scholarship program. Your donation today is a vote of confidence in the future of UELAC. Ms. Kelly Grant is a doctoral candidate in the Humanities PhD program at Concordia University, Montreal, Quebec. For her doctoral dissertation research, Kelly will undertake an interdisciplinary study of eighteenth-century clothing and material culture of Nova Scotia, focusing specifically on Planter and Loyalist immigrants. This project combines traditional archival scholarship with research creation and experiential learning as Kelly recreates extant items of textiles and clothing and then uses them in living history programs based on the recorded experiences of immigrant refugees during the Revolutionary period. The dissertation project will also include the creation of patterns of the weave structure of the cloth used as well as for constructing the garment itself. Preliminary research has uncovered extant garments from the eighteenth-century in collections housed at Ross-Thompson House (Shelburne, Nova Scotia), Uniacke House, just outside Halifax (Nova Scotia), the Dartmouth Heritage Museum (Nova Scotia), as well as the extensive collection housed in the New Brunswick Museum in Saint John. The Loyalist experience is integral to Kelly's personal history. Kelly is a direct descendant of Donald Grant, private, 4th Company, MacKinnon's Light Infantry, 84th Royal Highland Immigrants. He enlisted 27 November 1775 in New York/Boston harbor on the ship ASIA. Ms. Grant's family still holds the original grant of land through Governor John Wentworth in Pine Tree, Nova Scotia. Coming Soon: A personal biography and more detailed summary of Ms. Grant's dissertation proposal, A State of Upheaval: Dress and Personal Material Culture in Eighteenth-Century Nova Scotia to our UELAC Scholars page. This year, on May 27, UELAC will mark the 104th anniversary of its formation when an Act (Chapter 146, 4-5, Geo. V, 1914) was passed by the Parliament of Canada. If you are a new member of an Ontario branch of UELAC, you may not know of our special centenary Ontario Licence Plate project that kicked off the 2014 celebrations. How many of these special plates do you recognize in the parking lot when you attend your branch meetings? With 19 plates beginning with 02UE, you still have a chance to get a plate that you will remember and cause comments wherever you drive. SAVE: Until May 27, save $30 off the original price when you place your order. We will also ship your request FREE! Email education@uelac.org with your preferred number chosen from the following: 23, 26-28, 37, 42, 47, 52-54, 72, 73, 77, 90-92, 94, 97, 98. Send your cheque for $80.00 and a completed Licence Plates order form to the George Brown House office. If you have already shown your support of this UELAC Project, thank you. I like maps – a lot. I used to study the Rand McNally Road Atlas on long car trips. Sometimes when I'm homesick I'll meander through Halifax on Google Streetview. And this year I'm team-teaching a new course on "The Politics and Meaning of Maps." This is an Integrated Perspectives course, meaning a course taught by two faculty from different disciplines. All sophomores in the College of Arts & Sciences at Bucknell are required to take one. IPs are supposed to model how scholarship works: how different disciplines converge on a single issue; how differently-trained scholars work differently, but still treat questions of evidence and argument; how to communicate with each other through differences of interpretation; how academia is, at its best and its heart, a glorious opportunity to always learn more. My co-instructor is a digital humanist with a particular interest in early modern English drama. So if I read maps as artifacts of environmental history, of human impressions of and interventions in nature, her eye goes to a close reading of text, and her imagination goes to programs that might best serve to annotate and arrange these artifacts. Every day is a bit of an improv. Or a three-legged race. One of the hallmarks of Journal of the American Revolution is its ability to bring lesser-known yet compelling events of the War for Independence to the public's knowledge. Great battles and campaigns that altered the course of the war are always at the forefront of history, but smaller, more obscure actions often bore witness to the bravery and endurance of men on both sides. A cold February morning in Westchester County, New York, provides an excellent example of this. After a season which saw little campaigning around the New York City area, Sir Henry Clinton prepared to open 1780's actions against Charleston, South Carolina. The British expedition, numbering over 8,500 officers and men, would stretch the army's remaining garrison strength to the limits. Rhode Island's evacuation at the end of October 1779 eased the reduction of troops at New York somewhat, but left little for new commander Lt. Gen. Wilhelm Knyphausen to work with offensively. Under normal circumstances, the remaining troops, about 14,000 in number, would have been adequate to act upon the defensive for the safety of New York City and dependencies. But the winter of 1779-1780 was anything but normal. The key to controlling New York was command of the waterways. What made Manhattan Island, Long Island and Staten Island so defensible was that they were in fact all islands, something Washington learned all too well when he lost New York to the British in 1776. As long as the Royal Navy's warships controlled the rivers, harbors and sounds, Washington's troops would never seriously threaten Britain's American stronghold. The cold air and storms bracketing Clinton's departure from New York the end of that December was but a portent of things to come. George William Van Cleve, a researcher in law and history at the University of Seattle Law School and author of We Have Not A Government: The Articles of Confederation and the Road to the Constitution, takes us into the Confederation period. As we explore the Articles of Confederation and the Confederation period, George reveals: details about the Articles of Confederation and the type of government it established for the new United States; the political and economic climate within the United States between 1783 and 1787; And, how the Confederation Congress became stalemated and the steps early Americans took to get their government operating more smoothly. My 4th gr grandfather, William Foster UEL, appears to be in the same company as William Romanski's ancestors, so I thought I would share the Cole's notes of his story. William Foster was in the King's American Regiment (KAR), a private in Col. Fanning's Company. On the Dec 1777 muster roll, William and 5 other privates are recorded as deserters, they all deserted on Nov 25th. However, a few months later on the April 1778 muster roll, it's recorded that 3 of the men returned to the company on March 1, William Foster, Gilbert Foster and John Merritt. What is interesting to note that during the same time that William and Gilbert Foster were deserters from the KAR, a William and Gilbert Foster enlisted in the Continental Army in the 5th New York Regiment. Muster roll data show identical entries are made for a Private William Foster and Private Gilbert Foster, enlisting on January 14, 1778 "during war" and then later on the muster roll dated April 6, 1778, they are listed as "deserted shortly after enlisted". Apparently the Congress authorised a bounty of $10 to be given to every soldier who enlisted in the Continental Army for a period of three years...so possibly William and Gilbert enlisted to obtain the bounty and then deserted. Once he returned to the KAR in 1778, William Foster remained with regiment until the end of the war, then again he didn't have much of a choice. During the Southern campaign, William was captured in South Carolina in Feb 1781 and he remained a prisoner of war until his release in June 1783. One of the benefits of membership in a branch of UELAC is the Loyalist Gazette, our periodical which is available also to those non-members who purchase a subscription. Traditionally the publication was printed and mailed, but more recently it has been made available in digital format as well. This format offers colour throughout and an earlier delivery. Those who receive only the electronic version also help the association manage expenses as both printing and mailing costs are avoided. If you are a member or Gazette subscriber, and haven't yet but would like to try out the e-zine version of the Spring 2018 Gazette, complete the request form. Although I remain editor, we have a new design and layout team. I am looking forward to the result; I wonder if the changes will be minor, or somewhat more significant? Even with the changes, we appear to be roughly on schedule - in the mail on May 1. We will monitor progress and keep you apprised. The next Kawartha Branch UELAC meeting is our AGM on Sunday, 15 April 2018, at 2:00 p.m. in St. Paul's Presbyterian Church, Peterborough; guest speaker, Jillian Messervey, Heritage Programs Technologist, Sir Sanford Fleming College, will speak about "Preserving Fragile Paper Records". The AGM to follow. The Hancocks of Boston in Wool, Silk & Linen. Hannah Otis's (1732-1801) sampler "View of Boston Common" (c. 1750, Museum of Fine Arts, Boston) is a charming and significant pictorial narrative, capturing life in Boston prior to the Revolution. The connection of the sampler to a significant New England family, the documentary nature and large over-mantel size all serve to distinguish it as a preeminent example of school girl skill and, in this case, creativity. It is embroidered in wool and silk on a linen canvas. 29 Mar 1780 1780, British soldiers crossed Ashley River from south bank onto the Neck and begin establishing lines for Siege of Charleston South Carolina. Washington permitted Patriots to withdraw, but General Lincoln decided to stay and defend the city. 29 Mar 1776 Washington appoints Major General Putnam commander of the troops in New-York. 30 Mar 1775 King George orders all foreign trade with New England colonies banned. 28 Mar 1774 Parliament passes Coercive Acts in punishment for the Boston Tea Party. 27 Mar 1775 Thomas Jefferson elected to represent Virginia to the Continental Congress. 26 Mar 1776 The South-Carolina Provincial Congress adopts a new constitution & government. 25 Mar 1774 Parliament orders closure of port of Boston in retribution for the Boston Tea Party. Treasures Afoot: Shoe Stories from the Georgian Era. Mehitable Rindge Rogers wore London-made pumps of silk satin, in New Hampshire, 1760s Note 3inch French heel & elegant profile despite extensive wear. Meanwhile in England: An Unconventional Marchioness: The Life of Lady Salisbury. It is perhaps unkind to describe her as eccentric, but she certainly paid little heed to many conventional norms as she determinedly walked her own path. Household accounts indicate Martha Washington favored "best Violette Strasberg," a scented snuff popular among women. See her snuff box. Born April 4, 1932 in Saint John, N.B., passed away peacefully at home in Halifax surrounded by his loved ones on March 20, 2018. Donald was a son of the late Gordon H. and Lillian (Major) Lordly. A lifelong member of the Boy Scouts Association, Don was a King Scout, a Scouter and a founding member and past Guild Master of the 12th Canadian Baden-Powell Guild. He was a graduate of Acadia University and Nova Scotia Technical College (Dal Tech), Bachelor of Engineering '55 (Mechanical). Don served 20 years in the Reserves with the Royal Canadian Electrical and Mechanical Engineers, OC 20 Tech Sqn RCEME and Commanding Officer Halifax Service Battalion retiring in rank of Lieutenant Colonel. Beginning his engineering career with a fellowship in England, he was joined there by Betty as soon as she finished nursing school. They married in Gravesend, Kent before returning to settle down in life in Halifax. He worked as Manager of Mechanical Engineer and Technical Services, Nova Scotia Light and Power Limited and Nova Scotia Power Corporation until retirement in 1991 and was a life member of the Association of Professional Engineers of Nova Scotia. His role in the construction and management of Tufts Cove Generating Station included trips to Japan, where he established lifelong friends. Don served as National President Land Ordinance Engineering Association (LOREA-EMEA). 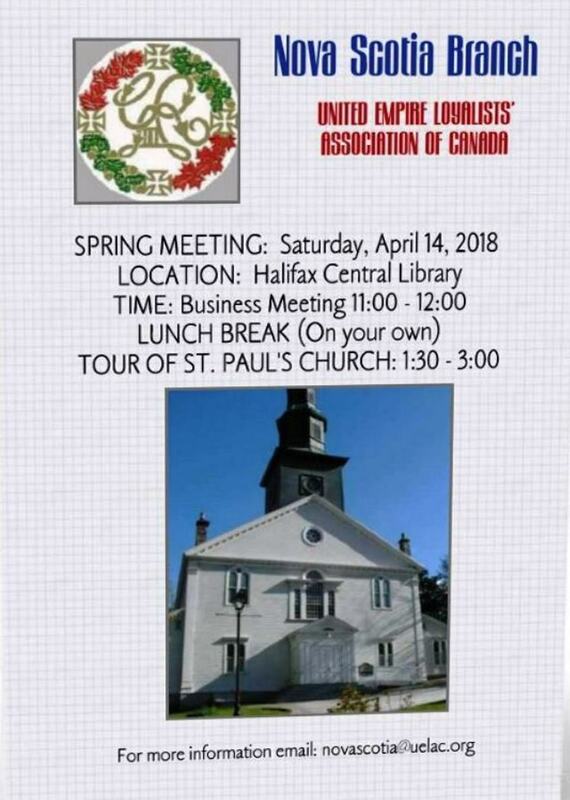 Don was a charter member and past president of the Halifax-Dartmouth Branch of the United Empire Loyalists' Association of Canada. A long-time member of St. Paul's Anglican Church, Halifax (Church Warden, Treasurer, Archives), he also acted as director and past chairman of the Old Burying Ground Foundation. Don's passion was music, playing trumpet throughout his life. He was a founding member of the Halifax Concert Band, performing with them for over 40 seasons. CBC Radio 2 played regularly in the family household. He loved canoeing and sailing "Hobbit", his Drascombe Lugger, out of Mackeral Cove in St. Margaret's Bay. He had a keen interest in history, photography and carpentry. Don and Betty traveled extensively enjoying many cycling tours and adventures throughout Europe and other parts of North America. "D" was a genuine and gentle soul, caring husband, father and grandfather. He will be dearly missed by all in his family and many good friends. He lives on forever in the hearts and memories of his wife, Betty (Gastevsen); sons, Michael (Takako), Andru (Judith), Preben, Matthew; grandsons, Kai and Taskar. He was predeceased by sister, Barbara (Saint John, N.B.). Arrangements are under the care of J. Albert Walker Funeral Home (2005) Ltd. A funeral service will be held in St. Paul's Anglican Church on Thursday, April 26th at 10 a.m. Donations may be made to the oldburyingground.ca or a charity of your choice. The Lordly family would like to extend a special thanks to the VON and QEII Palliative staff for their kind and compassionate support. Condolences may be left by visiting www.walkerfh.com. Don obtained his Certificate of Loyalist Descent in 1982 from the United Empire Loyalists' Association of Canada and was a descendant of Loyalist Stephen Humbert from New Jersey who settled in Saint John, New Brunswick in 1783. Over the years he was a constant contributor to the local branch of the Association. Don was quite helpful to me (Brian McConnell) when I was researching the article Loyalists in the Old Burying Ground at Halifax which was published in Loyalist Trails in January 2016; Don is credited in the notes.